A change is as good as a rest, they say. So why not think about a break closer to home, but somewhere that’s completely different from a hotel or B&B? We’ve found some quirky places all within easy reach throughout the South West. The Temple at Stancombe in the Cotswolds has been voted the most romantic destination in Britain by the Independent Magazine, and with just cause. A beautiful neoclassical hideaway in 20 acres of greenery, set by a tranquil lake: inspiration for romantics, poets – and wild swimmers. The Folly Gardens of Stancombe in Gloucestershire were the creation of Reverend David Purnell-Edwards who was married to a portly lady. As legend has it, aided by her large dowry, he embarked on the idea of an idealised walk which would encapsulate all the important civilizations around the two acre lake; including Chinese, Egyptian and Greek architectural styles. He devised a series of tunnels to reach the garden which were too narrow for his broad wife to pass through; she must have been quite a size some of the tunnels are at least three feet wide! With the help of a team of soldiers back from the Napoleonic Wars, the Reverend designed a walk which circled the lake and lead to The Temple and created for his love trysts with a local beautiful gypsy. 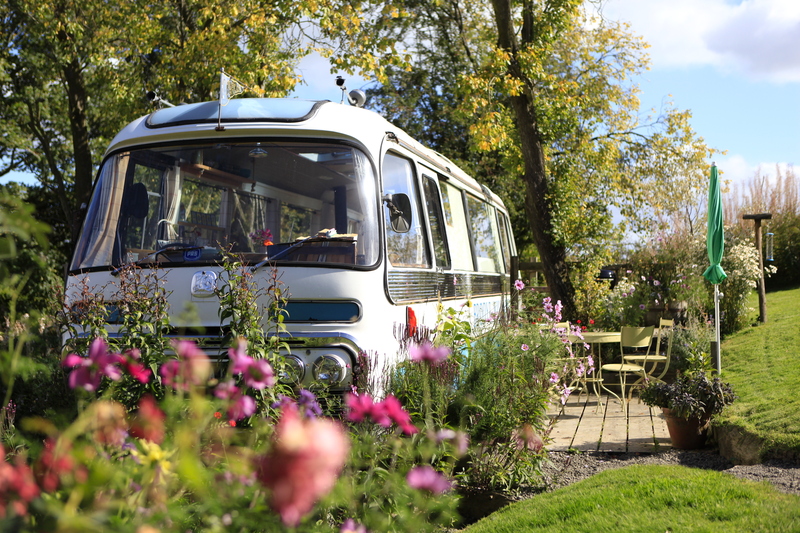 The bus is a lovingly converted Bedford Panoram and has a beautiful wooden floor, painted pine boarding and a well thought-out dining/kitchen area.There’s a cosy double bed and a wood-burning stove together with an L-shaped sofa seat that folds into a further double bed. Solar panels on the roof power the lights and a socket to charge phones, laptops etc.Outside there’s a decked area on two levels, a fire-pit for open air cooking and two level platforms to act as tent-pitch areas, accommodating up to a further four guests if needed. A few metres away lies a purpose built wooden bath house, containing a flushable toilet and a luxurious roll-top bath with shower above. A second wood-burner is installed for those chillier nights and the room comes complete with tea-light candles for the ultimate romantic bath experience.The Majestic Bus is located on the edge of the Radnorshire Hills, 5.5 miles away from the famous book town of Hay-on-Wye. Wild and open hills contrast with wooden valleys and green pastureland.Wildlife is abundant and a myriad of footpaths and quiet country lanes link everything together. The well-trodden Offas Dyke footpath lies just a few fields away and the sites of ancient encampments dot the surrounding hilltops. The exquisite 18th century Orangery sits in the grounds of Frampton Court, not far from Stroud and is the perfect place for discerning holidaymakers seeking elegance within an idyllic setting. 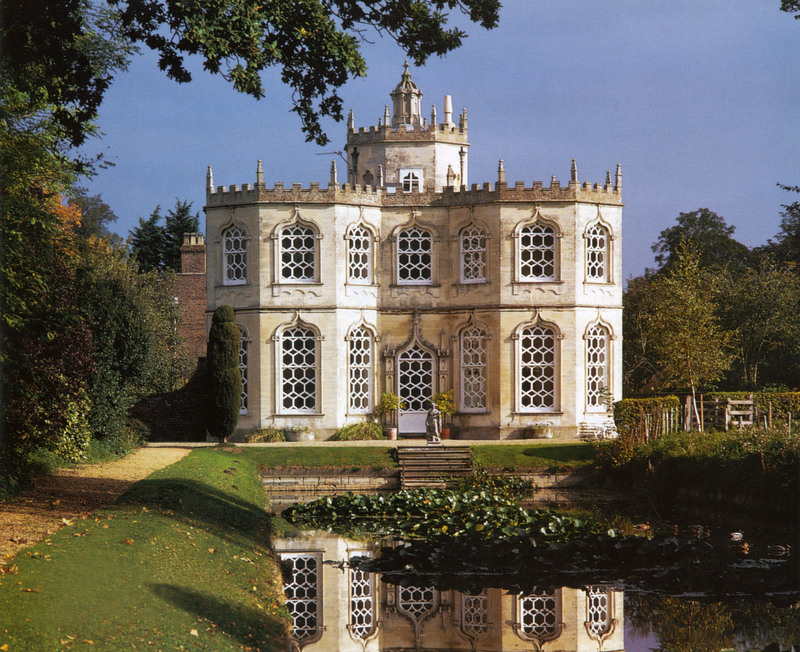 It sleeps up to eight people and has been described as “the prettiest garden building in all England”. It sits just off the village green in a secluded corner of the gardens surrounding Frampton Court with views across the park to the lake and woodland beyond. Converted to provide quirky but cosy self-catering accommodation, the main rooms are octagonal with arched windows. The stone and tile floors are original and the spiral stone staircase is stunning. The kitchen is fully equipped to cater for any occasion and the octagonal dining room with its ornate fireplace and views of the Dutch ornamental canal provides an ideal setting for a special meal or a simple family get together. The octagonal sitting room is cosily furnished with sofas with an open fire for winter days and chilly evenings. There is a TV, a DVD player and WiFi. The two double bedrooms have an ensuite bath or shower whilst the twin rooms have their own basins. There’s also a large family bathroom with a magnificent double-ended roll-top bath and large shower cubicle is downstairs. Brooks Guest House Bristol is a contemporary boutique guesthouse in central Bristol bang in the heart of the old town next to St Nicholas Market. What makes this place unique are the four Airstream caravans on the roof of the guesthouse, where you can also stay. The 20ft Rocket is the largest and has a 5ft double bed at one end and a seating area at the other which can convert to two single beds, ideal for two children up to 12 years old. They come with all mod cons including flat screen TVs with built in DVD, retro Roberts radio and Designer’s Guild curtains and cushions. There’s also a hospitality tray with tea and coffee making facilities and biscuits too. Each one features Eco heating with individual room temperature control and Eco LED and low energy lighting. The Rockets also have a small bathroom with Hans Grohe Eco showers and fluffy white towels. The Rockets have beautiful rooftop views of Bristol and each one has Free WiFi.